I know, I said there would be a good chance that the next version of Envy Code R would be out this weekend but the annoying sizing, thickness and cropping issues that came up at some sizes above and below the optimum 10 point were really annoying me. Many articles later, some playing around with Microsoft Visual TrueType and much frustration and experimentation later I think I’m on the right path. 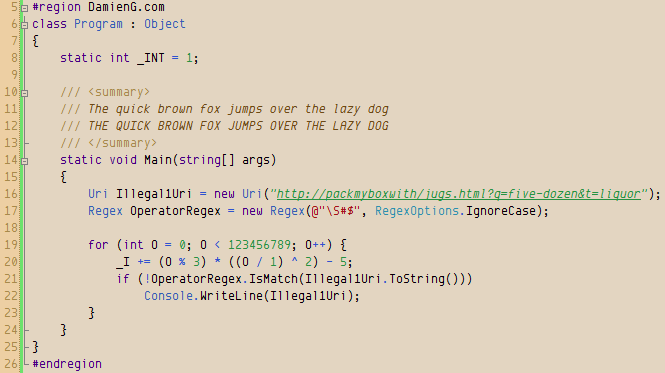 Here is how Envy Code R is looking on Windows right now with standard font smoothing. ClearType doesn’t look as good and I’m still learning the black art and the implications of each type of hinting instruction. Strangely, these hints seem to be ignored on the Mac which is still rendering everything a little too thick especially on curves. Perhaps that is why so many developers create a Mac-specific version? Once I’m happy with how the regular version works I’ll put it online for download and then whip the bold and italic variants in to shape and any feedback into regular for the proper 0.7 release.